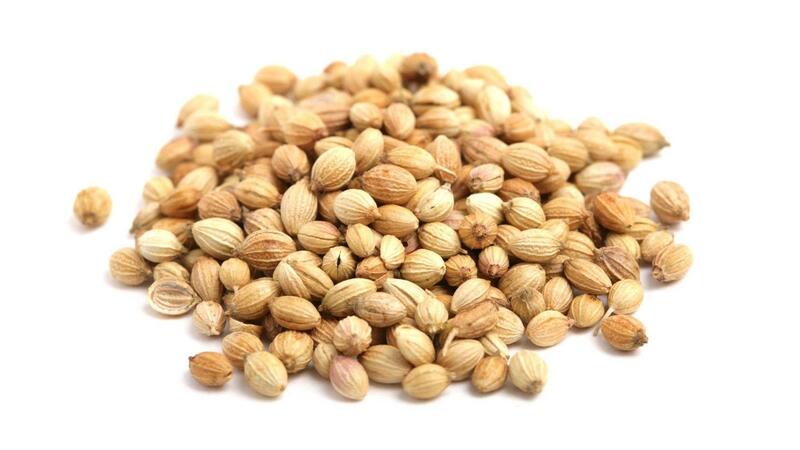 Coriander seeds are warm, mild and slightly sweet. It has a sweet fragrance and distinctive taste, which can be enhanced by lightly roasting before use. It is best bought whole as it is fragile and easy to grind or hammer. Whole seeds last for a long time. 1. The Fruits (Seeds) are widely used as condiments with or without Roasting in the preparation of Curry Powders, Sausages and Seasonings. 2. It is an important ingredient in the manufacture of food flavorings, in Bakery Products, Meat Products, Soda & Syrups, Puddings, Candy Preserves and Liquors. 3. In Ayurvedic medicines it is used as a Carminative, Refrigerant, Diuretic, and Aphrodisiac. 4. In Indian household medicines, it is used against Seasonal Fever, Stomach Disorders, and Nausea. 5. Coriander oil and oleoresins are primarily used in Seasonings for Sausages and other meat products. 6. The Arabs use it with lamb, goat and other types of meat. It goes with ham and pork, especially when it contains orange. 7. It enhances chicken, all types of vegetables, salads, and fish and seafood dishes. 8. Use with fish, mussels, shrimps; stuffed cabbages leave and mushroom, and lose you in its rich flavor. Combines perfectly with all spices but goes best with, Cardamom, Chili, Cinnamon, Cloves, Cumin, Ginger, Pepper and Turmeric.